A Wordle is a toy for generating “word clouds” from text that you provide. Wordles are created by Jonathan Feinberg’s online tool here. 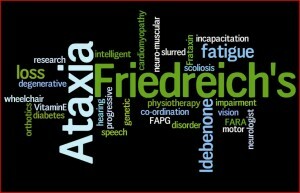 In this Wordle we have tried to use several terms associated with Friedreich’s Ataxia. We hope that this will help to educate and raise awareness.